More than 100 people tested their percussive timing skills throughout the day on Saturday in the third World's Most Accurate Drummer contest in Atlanta, Ga. at the Coltrin & Associates DCI Southeastern Championship. 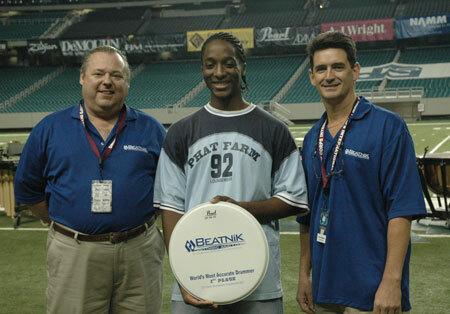 This contest, presented by Beatnik Rhythmic Analyzers, gave people of all backgrounds and ages the opportunity to see if they had what it takes to be the "World's Most Accurate Drummer," by playing an unchanging two-bar rhythm for two minutes on an official Beatnik Rhythmic Analyzer electronic drum pad. Marcus Greene, the World's Most Accurate Drummer from Atlanta, Ga. The highest possible score was 800 points, and Marcus Greene, 18, from Media, Pa., won the contest with a score of 728, earning him the title of the World's Most Accurate Drummer from Atlanta, Ga. "It's pretty surreal, I can't believe that I won tonight," said Greene. "For me, this contest was a focus issue, and I think anybody who takes enough time to focus on the task at hand can accomplish anything." The World's Most Accurate Drummer contest presented by Beatnik Rhythmic Analyzers will be held again at the major Drum Corps International events in San Antonio and Indianapolis, and in Pasadena, Calif. for the Drum Corps International World Championships. Learn more about the World's Most Accurate Drummer contest. Practice the lick you'll need to play for the World's Most Accurate Drummer contest.